Secure sanitary tubing attachments that are easy to use and quick to assemble are critical in numerous low-pressure laboratory, biotechnology and pharmaceutical applications. Contamination of fluids and product loss through leakage can be costly. Monobarb Sanitary Fittings provide a superior connection to tubing through a single-barb construction, reducing the potential for leakage. In addition, tubing clamps secure to the fittings behind the barbed area, which limits the risk of flexible tubing being cut from a sharp, barbed edge and provides for attachment to a smooth surface. Molded seams and abrupt angles, frequently found in other fitting designs, can cause turbulence ("dead space") or stagnation of fluid flow, creating areas for potential bacterial growth. Monobarb Fittings are entirely free of these seams and angles, eliminating both potential problems. The exterior surface of Monobarb Fittings is designed to reduce potential contamination from wicking fluids by eliminating seams near fluid entry points. Each fitting has a gradual taper between the inlet and the main body of the connector. This taper, along with an ultra-smooth inner surface, permits a more even and undisturbed passage of fluid, and facilitates complete cleaning. 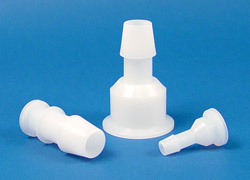 Sani-Tech West provides a full line of Monobarb fittings in polypropylene; as well as custom materials like PVDF. Monobarb Sanitary Fittings have been engineered to provide a sanitary connection point for fluids transported through flexible tubing. Sani-Tech West supplies a broad line of flexible tubing formulations that are ideally suited for use in conjunction with these sanitary fittings — Contact us today with your sanitary applications.